It is Boxing Day and there are unfamiliar and suspicious people in the house. In the greenhouse there is almost nothing. Someone has unaccountably abandoned a length of horticultural fleece on the bench in the greenhouse though, all folded up and surprisingly Percy-sized. It is therefore in need of regular checking, to make sure it is still there and has not been stolen. It is fortunate that the empty flower pots are close to hand too, as they can be guarded at the same time. Still more fortunate is the fact that someone has overlooked the proper closing of the door and wedged it open to exactly the same width as Percy. Sometimes the world is good to Percy. 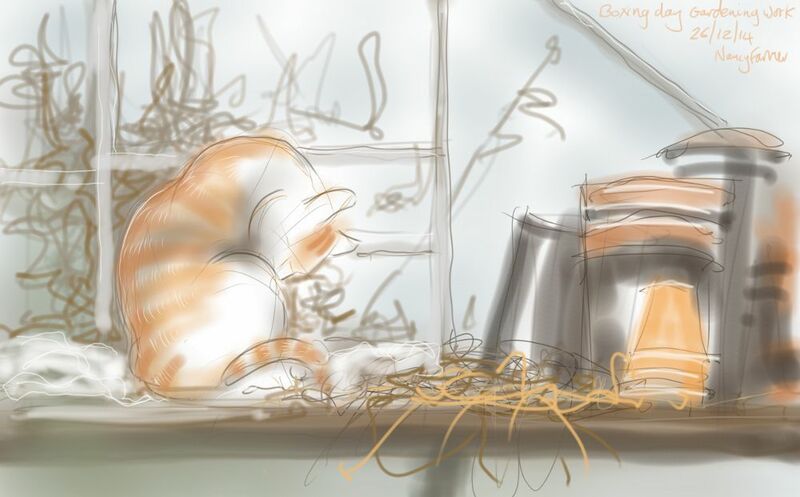 This entry was posted in Cats and tagged art, cat, cat drawing, cat washing, cat-of-the-day, digital sketch, drawing, greenhouse, illustration on December 26, 2014 by Nancy Farmer.